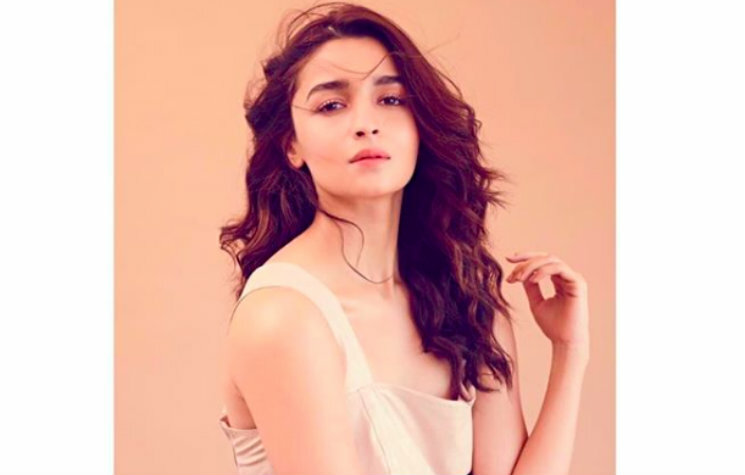 When it comes to colour and outfit goals, you can always depend on Alia Bhatt for inspiration, because she is arguably the best in the business to pick the most trending hues and chic designs. Just today, this Gully Boy actress affirmed our belief in her sartorial choices, as she brightened up our boring February day with this blush hued, front wrap dress by the European label, Nanushka. Alia exuded tons of cheerfulness with uber femininity as she wore this pretty shade in a body hugging silhouette and quirky side-buttoned fastening. The dress also featured a square neck and embossed crocodile effect, further topped-off with a matching waist belt. Only to add to the excitement, one glimpse at Alia's outfit of the day brought flashes of the recently announced Pantone Colour Of The Year 2019 "Living Coral". Per usual, Alia looked extremely pretty and her overall look seemed an apt choice, considering the rising temperatures in the now humid Mumbai. Keeping her dress as the centre piece of her look, Alia went sans any accessory. Even her choice of shoes was clear. And to compliment the soft hue, Alia kept rest of her look, both, pretty and simple. With open beach waves and soft peach makeup pigments she gave her style seal to this colour trend. Currently, Alia is keeping super busy promoting her upcoming flick, Gully Boy. This only means that we will witness yet another awesome OOTD. Kangana Ranaut SLAMS Alia Bhatt for Not Reciprocating Favours Actor Chirag Patil receives a HEARTWARMING letter from his father!